Where have all those used Specs gone? That’s the derivation, of course, of the word we use to describe those times when we pack up the tent and pitch it somewhere sunny like Jonah (Jonah 4:5), or crawl off in a caravan towards the sand like Joseph after his brothers sold him into slavery (Genesis 37:25), or perhaps even go sailing round the Med’ like St. Paul (Acts 27:14ff), though hopefully without being shipwrecked. Holidays as we know them are quite a recent innovation. Indeed the very idea of having paid time off work to go away somewhere else for a few weeks in the year seems a little ridiculous in itself. The only time off that many people used to have was when there was a Holy Day or a religious celebration like Christmas or Easter which still survive in the popular imagination as times of rest from work so as to celebrate the feast. Though these great feasts have doubtless survived through their bizarre cultural accretions, other lesser holy days have lost their popular significance and with it the time off - for instance Ascension Day and as last month, the feast of the Transfiguration. No holiday on the holy day. But we don’t take our holidays on holy days any more anyway, we tend to pick the slack Summer months to disappear for a break when work is slow, schools are out and the sun is shining. Should we stop calling them holidays now and refer instead to a vacation, an emptying as in academic institutions, a space, a void, to be filled with nothing in particular? What is holy about them now? Even though we no longer take time off to celebrate all the red letter days in the book, we still make it a communal habit to take a decent chunk of rest at least once a year, and this I believe is holy. Rest is good for you, the more the better, a genuinely holy opportunity to be yourself rather than to have to do what others expect of you - after all, God himself rested on the seventh day (Genesis 2:3). But all rest is holy, not just the Sabbath day, it is the chance to discover what God made you to be, free from the pressures and distractions of life. Rest is time to think and time to meet God in your prayers. For goodness sake, don’t squander such a valuable and precious commodity on work! Holidays are far more important. That’s what the Tour Company called it - and we thought ‘What a good title!’ Little did we know what we were in for. It was an adventure, an experience, more than a holiday. It all started when the taxi called at 4.00am to take us to the airport, something like 20 hours later we arrived at Lima airport to an enthusiastic crowd, but they were not looking for us but for some exile who was returning because of the elections. The next day we were taken on a tour of Lima where it never rains and, consequently, we were able to see the ruins of a mud-brick fortress, over 500 years old. Many of Lima’s buildings date back to the Spanish period and are quite beautiful but we were not encouraged to wander. 2.30am the following morning we received an early call for the plane to Cuzco where we reached the hotel at about 9.00am. Our rooms, understandably, were not ready. The previous occupants had barely departed! We were advised to relax for the rest of the morning and to drink coca tea. This was to help us adjust to the altitude. Oxygen cylinders were readily available in the hotels and on the trains for anyone overcome by the altitude. In the afternoon we visited the Dominican monastery which incorporated an Inca temple. The Incas appear to have been an amazing people who flourished for about 500 years and constructed the most astounding buildings. Most of them had stone walls, without mortar, but so carefully slotted together that earthquakes have not affected them. Some of the bigger ones incorporate stones up to 100 tonnes in weight, coming from quarries at least 4 miles away. The Incas, it is said, did not know about writing or the wheel! But some of their constructions are colossal. A further oddity about the Incas and the Nazcas - another early Peruvian civilization - was their ability to envisage constructions on the ground as if they were viewing them from several hundred feet in the air. Just outside Cuzco is a vast construction, temple or fortress or both, which was designed as the head of the Puma of which Cuzco was the body! Later on in the holiday we flew over the Nazca lines where lines or paths have been carved on mountains and in the desert, and vast drawings of birds and animals, such as dog, heron, humming bird, spider, monkey, condor, up to 200 metres in length, and believed, by some, to represent the Nazca zodiac. Others believe that they were tribal/family crests. Another early call saw us off by train to Machu Picchu (9000 ft but 1000 ft lower than Cuzco), the most famous of the Inca cities, to which most of the Inca trails lead. It had been lost in the forest until it was stumbled upon by an American explorer in 1911. Photos of it are the most usual advertisements for travel to Peru but, to see it in reality, it is just breathtaking - it seems to go on and on, and up and up. The Inca trail to its main gateway comes over the mountain and down to the city. A second train journey, about 10½ hours, took us to Juliaca, on the way to Puno, even higher. Apart from the interesting countryside it became apparent that there were no level crossings with gates in Peru - the train driver sounded his klaxon and pressed on. Of course the same conditions apply in town, where the klaxon goes continuously until you reach the station where, surprisingly, there is a platform. I suspect that, in many cases, the towns have grown up, or enlarged around the tracks, so that the mud-brick, adobe, houses are about 2-3 metres from the rails and, in the space between the houses and the rails, the washing is hung out, furniture made, cars and bikes repaired and goods sold in open air markets. From our hotel in Puno, on Lake Titicaca, we boated out to the floating islands of the Uros Indians. Apparently, many years ago they were being persecuted and decided that the only way to escape was to create islands from the reeds which grow in the lake and to settle on them. The islands consist of layer upon layer of reeds on which they build their reed houses, keep their livestock (certainly sheep) and also tethered cormorants which they use for fishing. They also make the most beautiful reed boats. Recently the government has started some island schools. One of the most unexpected sights was that they even have solar panels! Peru is a wonderful country. It has a bit of everything - sea coast, mountains, some with perpetual snow, jungle, rivers, pasture and arable land, forest and desert and even an oasis with people sand-boarding down the dunes. I mustn’t forget the llama and alpaca, nor the guinea pig, which is said to be a staple food. The one house we visited - it had been an Inca house which had fallen upon bad times and now housed about 4 families round the courtyard - also housed a small tribe of guinea pigs scrabbling on the earth floor on which, we were assured, the family put down their bedding and slept at night, with granny and granddad watching over them from the shelf, or, at least, their skulls. As a consequence of the Spanish conquest, the people of Peru were converted to Catholicism, but the impression we gained from some of the local guides we met was that this conversion has not gone very deep and that there is still a strong persistence of the earlier beliefs. Stephen and Nigel in Pate’s Team A, and Elizabeth and Kate in Team B, have all returned home safely from Peru. Earlier on this year the Mothers’ Union appealed for used spectacles for their Diocesan Overseas Project and the parish was most helpful in supplying a large quantity. More recently, the Rwandan people were delighted when the consignment of 700 pairs sent earlier this year arrived. Freda Kolini, the Archbishop’s, wife was in London recently and related how they shared them between the dioceses. The result of our labours throughout the diocese was that nearly 2000 pairs were cleaned, checked, boxed and packed and are en route to Burundi. Burundi was chosen because it is one of three countries (Malawi and Sudan being the others) where the MU have started pilot schemes for a major literacy project in order to reduce the very high illiteracy rate (on average between 60% and 70%). Since many of the women need specs but cannot afford them, hopefully our work will ensure that they can at least see what is being taught! By educating the mothers it is hoped that future generations of children will be literate as in many countries education has to be paid for and often families cannot afford to send their children to school. Many people and firms have willingly helped with this project. All supplies have been given: specs (all washed and checked), empty cases, bubble wrap and shoe boxes. At the moment we are not collecting any more pairs. However I would like to thank everybody for their help and assure you that our members in Burundi will certainly appreciate what otherwise might be collecting dust or cluttering up drawers. On the 15th of July around sixty children turned up for a day of craft and activities orientated around the story of Jonah and the Whale, culminating in a short service. To start the day all the children gathered with their group leaders for an introductory session. We heard the story, and learned a new song. The children found the song, ‘Go Down Jonah’ from Jonah Man Jazz by Michael Hurd, enjoyable to learn even though it was quite difficult. I thought this song was very fitting. The different groups then began various activities, five in all. At the instruments workshop you could make a variety of instruments, drums, shakers, and tambourines. These would be used to represent the wind and the rain during the storm in the play performed the next day in both churches. This workshop was good as it was very well suited to all age groups. The tambourines were quite easy for younger children, whereas the drums were a bit harder and better for the older ones. Making the two boats was an activity thoroughly enjoyed by all the children. The first group had to design the boats using shoeboxes, which I thought was a very good idea, and the other groups then made them from the bigger boxes. The boat was very effective during the story the next day; it stood out in the church and it was something that everyone had taken part in. Similarly the whale painting was very good. The children could sponge on a variety of different colours to represent the whale and the water, and everyone enjoyed the painting and getting that little bit messy. Everyone also enjoyed the decorating of the whale-shaped biscuits, and they had something to take home. The wiggly worms were made from two strips of card with a face. All the children found these good fun to make, and enjoyed using them the next day to eat the tree which was also made in this group. The tree was made from a children’s climbing tube, so that it could grow. I thought this was a very good idea. 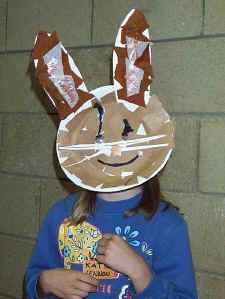 The children found it great fun to make the masks; they could make one of a number of different animals, including lions, horses and pigs. These looked very effective and the children enjoyed wearing them the next day in the play. At the end of the day there was a short service, to which the parents were invited. We sang the song ‘Go Down Jonah’, had some short prayers and listened to the story of Jonah and the Whale. I think the day was very well organised and was a great success, and all the children enjoyed themselves thoroughly. A big ‘Thank You’ from me to everyone who helped with ‘Jonah the Groaner’. See lots more pictures of the day in 'Our Events'. About three years ago Fr Stephen invited Lillian Brockman to become our Parish Archivist to deal with register enquiries, which come in from all over the world. For a long time Lillian has been interested in family history, and now she had a mission. One thing that family historians like to do if they can’t trace relatives in the usual births, marriages and deaths registers is to look at the grave stones in the churchyard of the place where the family lived. However it can be a long journey to get there and when there, the grave stone may be unreadable! Lillian’s mission was to record all the inscriptions in our churchyard - it has taken her all this time, but she has done it. Many inscriptions were hard to read. One trick was to look down a cardboard tube held close to the stone. Any cleaning had to be very gently done with a toothbrush. All her work had to be checked by members of the Gloucestershire Family History Society. Then it all had to be checked again by a member of the Society of Genealogists. Poor Fred Brockman had rather random meal times for a while! Now it is all finished and recorded in a file three inches thick. However, it is also on computer and Lillian can print out any part that is required. We do have to thank Lillian very much for recording what will otherwise be lost for ever as the tombstones gradually deteriorate. In one or two cases this has already happened. There will be an index kept in church for on-the-spot reference and Lillian will I am sure be ready to help with more detailed queries. Ken tells me that he was horrified to read his own name in Lillian’s book along with those of his deceased mother and uncle. He assures me he is alive and well, and has now recalled why he is included. Can you spot the plaque with Ken’s name on it? A clue: it is in the church, not the churchyard. In late May we, members of St Nicolas’ choir and partners, set out for a singing visit to the Norske Kirke, Oslo, where our former organist and choir master, Colin Smith, is now the resident organist. 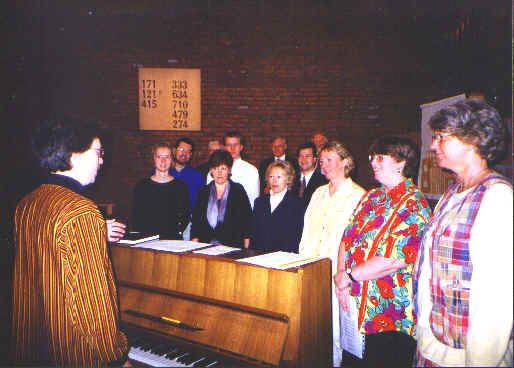 We set out to join the Norwegian church choir and to sing at the Sunday service. Over the past weeks we had practised Schubert’s Mass (to be sung in German), two motets (one in Norwegian, one in English) and the eight hymns all in Norwegian. It was a linguistic as well as a musical challenge! On the day, careful placement of the English singers between the Norwegian singers helped the pronunciation. A rigorous rehearsal on the Saturday night put us in good stead for the Sunday. 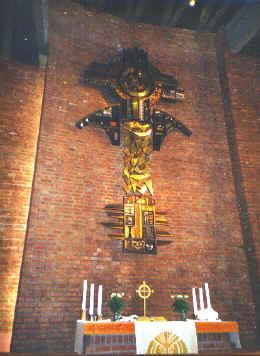 The liturgy of the service is very similar to the Anglican. There are however some confusing differences, e.g. the congregation sits to sing and stands to pray; the congregation surges to receive communion, which is offered in individual chalices. There was a relaxed attitude to children, who coped well with the hour and three-quarter service. After the service a hundred or more members of the church enjoyed coffee and home made biscuits and cake as they sat chatting at tables (complete with fresh flowers) in the superb social facilities. The weather did not match the warmth of the welcome of our hosts. (We all stayed with church families.) Colin’s planned picnic on an island in the fjord had to be abandoned. It rained and it rained. In true British spirit we went around like drenched creatures but we saw a great deal: the Viking and Kontiki museums; the Olympic ski jump (we hold Eddie the Eagle in new esteem); the sights of Oslo. We jumped on and off trams, underground trains, boats, buses - all for 80p unlimited travel for 24 hours! The stringent laws on alcohol were a source of surprise. One of our members asked for a bottle of wine at a supermarket to receive a surprised response at such a request. The one and only wine shop lies hidden in the centre of Oslo and would have entailed a two-hour expedition to make the purchase. We felt sad at leaving Colin, who returned us to the airport in our Rent a Wreck mini van. (Yes, that is the name of the company.) We record our heartfelt thanks to our hosts and particularly to Colin for enabling such a memorable visit. We look forward to our Norwegian friends coming to Prestbury. A strange season for all involved largely on account of those who weren’t. When the Welsh dioceses failed to field teams, that left Gloucs, Worcs, and Coventry to scrap it out in a sort of extended triangular match. Our usual pathetic turn out and last minute ring around guaranteed our safe passage to nowhere while Worcester were the lucky winners of a quarter final place against the Diocese of London. How fortunate we were to have played the gentlemen’s game against Worcester since their meeting with the Big Boys saw them thrashed quite soundly with an embarrassing report in the Church Times. I am sure we could have done a lot worse, however. So, having lost to the team from Ecclesiastical Insurance as well as to our clerical opponents, we stuck it out to the end with a match against a team of Old Boys from the King’s School where a late declaration saw the match drawn much to everyone’s delight. This latter result means that I can’t exactly claim that we lost the lot, but I can at least state that we failed to win a single match. Our best player has left and gone to the Diocese of Leicester, but this has had the effect of making the rest of us take more responsibility for our actions on the pitch. Added to this is the usual speculation about who might be persuaded to join us next year from the new crop of curates or new incumbents. I hear rumours that the soon to be appointed new archdeacon of Gloucester can swing a bat a bit. Only when it becomes compulsory, however, will anyone ever take diocesan cricket as seriously as it deserves. Perhaps the odd supporter or two might make the difference next year. Did I forget to tell you how many runs I scored? How careless of me. Each year, diocesan teams from all over the country compete for the Church Times Clergy Cricket Cup. Fr Paul has recently completed his second season in the Gloucester Diocese team, with slightly better personal results than he implies above! This month’s musician is Andrew. The trombone has three different parts. The slide, the bell and the mouthpiece. You play a trombone by blowing a raspberry into the mouthpiece that makes the trombone vibrate creating sound waves. Unlike most brass instruments the trombone does not have valves (buttons), but has a slide that you move up and down to get different notes. Most of them are low notes. I have been playing the trombone for 2 years now and I have become quite good. I now play for the school orchestra. St Mary’s Junior School marked the end of the school year with two concerts, one performed by Years 3 & 4, the other by Years 5 & 6. Both concerts were thematically based, the younger children taking Zoo Animals whilst the older children wrote and played a musical interpretation of J K Rowling’s book Harry Potter and the Philosopher’s Stone as part of theirs. There were spirited performances all round with the pupils demonstrating their skills with brass, string and wind instruments, collectively and individually. In the Years 3 & 4 concert the audience particularly enjoyed the songs ‘The Gnu’, ‘The Hippopotamus’ (you know … mud, mud, glorious mud!) and ‘The Warthog’. Years 5 & 6 excelled with rousing renditions of songs from the musicals such as the theme from The Lion King, Oliver’s food glorious food, and McCavity from Cats. Well done to everyone who made it happen, a splendid way to sign off the year. A musical feast enjoyed by all. Prestbury St Mary’s Bellringers have been quite active this year, starting on 1st January with midnight ringing and then a “date touch” of 2000 changes of Grandsire Triples later in the day. We have 18 local members, ranging in age from 13 to 87 and with a wide range of abilities - not necessarily correlating with age! As well as normal ringing for services and weddings, we have achieved a number of quarter peals. Harder to achieve is a full peal (3 hours’ continuous change ringing); the one we attempted for the Queen Mother’s birthday unfortunately failed. We urgently need sheets of tissue paper, preferably white, to wrap the white linen altar cloths in at St Mary’s. If you have any spare, please leave it in the marked envelope in the lost property box just inside the door of the church. Thank you. A swift look at what will be happening from September in the Parish’s Youth Work. The Friday Night Youth Club: a relaxed atmosphere with activities to challenge and stretch. We will be looking to build on our good relationships with the regular group and to welcome new faces too. - there must be something for everyone here! Join in with the fun and fellowship of the Parish Barbecue in the grounds of St Mary’s Infant School in Bouncers Lane. Bring your own garden chairs, picnic rugs and something to drink. Arrive from 12.30pm onwards. Food will be provided (and cooked for you!). Tickets are on sale in both Churches, prices are:- adults £4, children £2, family tickets £10. Don’t miss it! A rare opportunity to visit the Cathedral in the evening. Beginning at 7.30pm and finishing by 9.00pm with Compline. Only 20 places are available - contact Fr. Michael if you are interested. Lifts can be arranged! As part of the celebrations for the Millennium anniversary of Our Lord’s birth, the image of Our Lady of Walsingham is going on pilgrimage! It is not too late to book a seat on our coach going to Llandaff Cathedral in Cardiff, on Saturday 16th September. The coach will leave Prestbury at 9.30am to arrive in time for the Festival Eucharist at 12 noon. There will also be activities for young pilgrims (aged 7 - 12 years). After a picnic lunch, we will leave Cardiff to return home via Chepstow, where we have booked a WI tea! Seats on the coach can be booked by calling Liz Greenhow. In St Nicolas’ Hall on Friday 29th September at 7.30pm. There will be a bar and a ‘bring and share’ buffet. Ticket prices (to cover the cost of the live band) are:- adults £2.50, children £1.50, family ticket £7. The Barn Dance will follow a Eucharist, in St Nicolas’ Church at 6.30pm, to celebrate the Feast of St Michael and All Angels. The next concert, on Wednesday 6th September, will be a ’Cello Recital by Warwick Cole, who is already well known to us as a harpsichord player and organist. Coffee and biscuits are available at 10.30am and the concert starts at 11 o’clock. Admission is free. There will be a retiring collection in aid of church funds.